Lubricants behave differently at high and low temperatures. An oil can, in effect, be characterized by its viscosity, its flow resistance or by the thickness of its oil film. Viscosity varies according to temperature in the following way: the higher the temperature, the more fluid and less viscous the oil will be. It should remain fluid at low temperatures (to make cold starts easier) and viscous at high temperatures (in order to provide protection and sealing).The grades that have been optimized for each of your oils are detailed in your service manual. 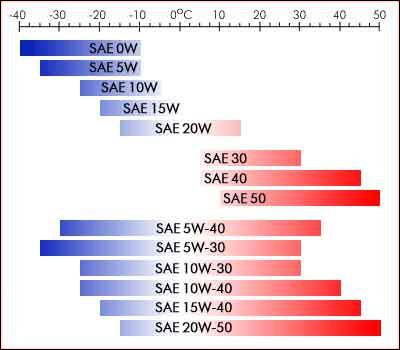 The SAE (Society of Automotive Engineers) has developed a means of classifying lubricants in order to specify their viscosity levels when hot and when cold. The viscosity designation is made up of two numbers separated by the letter “W” (for “Winter” for the cold grade).The numbers that come before the W refer to the product’s cold grade, i.e., its viscosity at low temperatures. The lower the viscosity when cold, the more fluid the oil is at low temperatures and the more easily it can be pumped.Greater levels of fluidity at low temperatures make cold starts easier. The numbers to the right of the letter “W” are its hot grade.The higher the grade, the more viscous the oil will be at high temperatures. To find out which oil and which viscosity you should use for your vehicle, refer to the manufacturer's service manual. What does the oil weight actually mean? An oil’s weight refers to it’s measured viscosity at a given temperature. The temperature of the oil is important when measuring it’s viscosity because an oil becomes thinner, or less viscous, when it is heated. Conversely, oil becomes thicker, or more viscous, when it is cooled. Because oil viscosity changes with temperature, an oil’s weight is determined by the measured viscosity at a specific temperature (100 deg C). The unit of measure is called a centistroke (cSt). The higher the measure of viscosity at 100 deg C in centistrokes (cSt), the higher the oil’s weight. The following chart shows the viscosity an oil must be at a given temperature for each oil weight.